When taken as prescribed, Adderall increases dopamine slowly in the brain. But you can get high on Adderall in high doses, or by crushing, snorting or injecting it…while Adderall addiction risk increases. More here. The short answer is: YES, Adderall can get you high. But, if you are taking Adderall as prescribed for ADHD or ADD, you will probably not feel the euphoric effects of Adderall at all. This is because you start to benefit from the therapeutic effect of Adderall as the medication slowly and steadily increases levels of dopamine in the brain. So, although euphoria is one adverse effect reported as a result of taking Adderall, normal use of Adderall does not usually get you high. 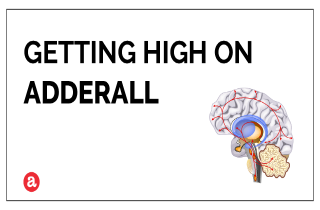 If you want to get high on Adderall…there are ways to do it. But you risk getting physically and mentally addicted to its effects. We review the risk of Adderall addiction here. Amphetamines, such as Adderall, are stimulants that often come in pill form and are prescribed by doctors for medical problems. However, amphetamines can also be abused. That is, you can take Adderall without a prescription, take it in higher amounts or crush, snort or inject it. If you are crushing Adderall, snorting it or injecting it … you make get high, but you are also disrupting normal communication between brain cells. In fact, brain circuits and addiction are closely related. So getting high on Adderall may lead to the cycle of addiction. Although, Adderall use over time may cause physical dependence, Adderall dependence symptoms end after a period of withdrawal. In fact, Experts believe that people taking Adderall for ADHD do not become addicted to the stimulant medications if it is taken in the form and dosage prescribed. In contrast to physical tolerance and dependence, addiction is characterized by cravings, obsessive thoughts and mental preoccupation with Adderall after it is out of the system. Although experts have not yet proven a relationship, adolescents treated with stimulant medications may be especially susceptible to misuse of Adderall and potential addiction. But anyone who takes Adderall to get high has the potential to develop addiction to amphetamines. Do you have questions about Adderall? Please leave your Adderall questions below. We will be happy to answer them personally and may even create a new article just for you. Please provide an update on your condition if you are able to share about it. It’s now 7 years later since your post. How have things gone? Did you get help for your addiction? How were you able to secure such a large amount of Adderall for daily consumption? I hope you are ok now. please reply. Does Adderall affect your kidneys and if so how? Im 15 and have not been diagnosed with any conditions (ADHD,ADD). I took a 40mg adderall pill today because i was curious what the affects would be and also wether it would help me at school which i know is stupid but im not looking for a lecture i just want to know why it affected me the way it did. When the affects first started to kick in there was a very slight euphoric feeling and i felt focused and wanted to get work done, which i did. However this only lasted about 1 hour and after i felt extremely tired and depressed. I also had strange sensations in my body and sometimes it was hard for me to focus my vision. The most noticeable of these affects were the depression and tiredness. This lasted for around 6 hours and i started to get a bad headache Which i still have.Is this a usual affect of aderall? Substances seem to have a different affect on me to most people and i was wondering if aderall is the same. Safe my donny gs. Hi Jim. I’m really sorry for your loss… Hope you message will inspire others to end their addiction. If adult is calm in the early morning and then takes their Adderall 20mg sometimes 30mg late morning and has a lot of energy is this an indication that they are on the wrong meds? I suffer from chronic Lyme Disease which among other things has caused me to have serious problems with sleep and depression. (My 23 year old daughter was killed 2 years ago which has worsened my sleep issues & depression) I was also abused by my ex husband for 25 years, he liked to choke & push causing 3 fractures in my lower back, herniated discs & herniated discs and nerve damage in my neck for which I had a cervical spinal fusion in 2007. The surgery did not fix the problem & I now have to go to pain management and am on the fentanyl patch 50 mcg/h, oxycodone hydrochloride tab 15 mg 5x a day, tizanidine HCL cspsule 6mg 3x a day, gab spending tab 600mg 2tab 3x a day, for panic attacks resulting from PTSD, major depression and restless leg syndrome I take Ativan tab 1mg 3x a day, I also have GERD FOR WHICH I take Zantac 150mg 2x a day. I realize I have a lot of medical issues and am on considerable medication but the sleep issue causes me to not be able to sleep sometimes for a few days and when I do sleep I wake often, can’t fall back to sleep and so on. I have tried belsomra, lunesta, they don’t work. I used to take Ambien for years but I started to eat at nite, make phone calls for which I had no memory, it also had gotten to the point that it only occasionally worked so I no longer take it. I can’t take anti depressants because they cause excruciating leg pain (I’m not sure if it’s from the Lyme disease, restless leg syndrome or the abuse) I’m 55 years old & reading about adderall it sounds like it could help my sleep issues as well as the depression but I have concerns about the affects on the heart & nervous system. I’m adopted so I have no family history. Are there tests that can be done to check and see if there are any concerns about my heart or my liver given all the medication I’ve been on since approximately 2007. If you could advise me as to the direction to take reguarding the questions I have about my medical conditions, medication I’m already on then adding adderall to the mix, and tests to see if my heart and other systems would be able to handle it. Ok thanks for any advise & help you could give me concerning this matter, oh I’m 5’3′ and weigh 138 lbs. Hello Shelly. Adderall is prescribed in doses of 5-30 mg daily. Your dose of 10 mg may be just your start dose that your doctor gave you to get your body accustomed to the medication. Starting off on a high dose is not recommended. Or, maybe there is just a period of time before the medication achieves a steady level in your body and starts providing the wanted effects. Either way, I suggest you report this to your doctor. You may get an upped dose, or you may get switched to another medication that works for you. Hello I’m Zach, I have been wondering what has happened to me for a few years now. I started taking adderall and other amphetimines like focaline at a young age. I started to find out if I take more it can make me feel good, not knowing at a young age that I was abusing the medication. I took them like that for around 5 years. It has made me crazy, my personality changes it has killed my drive, it has wrecked my whole life, it has made me not have emotions. Long story short I found this page while I was looking up stuff about midicince and why I’m like this, and all the symptoms that are listed on here are me. I knew at this point that I have found why I’m like this. I am damaged from it bad, to where I don’t think I can be fixed. I have learned a lot about it by studying on my own time and thinking all the time. I just wish I could talk to a professional about this to get some help. Thank you! I have a son who is now 28 years old, he has been diagnosed with ADHD about 6 years or 7 years ago. First he was taking 10 mg amphetamine to be able to study. He has some hearing problems and wearing hearing aids. He then stopped going to his first doctor and went to another doctor and this doctor perscribed him 30 mg xr and then he became a totally differnt person. He became very abusive towrds me and his mom, he married this lady from India and she was here in 2014 and when she left to vsit her parents she couldnt come back for two years . During this two years our life was misreble because of my son missing his wife and doing adderal. He went to all these crazy places and he promised to come home at 10 PM and he will stay up all night and go to work in the morning. He would not sleep 5 nights in a row and was very abusive towards us. His wife eventually came from back from India and they get in fights. We did write a letter to his doctor to stop giving him adderall perscription and his doctor stopped , But now, he gets it online from other countries. His excuse is to study and he denies taking adderall . He now lives with his wife and his wife gives him low dosage but it sems like he can not live without adderall . WE dont know what will happen to him, I am scared. My granddaughter is on Adderall XRAY 30mg. She hasn’t taken them for 3 days. She started with 5 mg a few years ago but now has been upped gradually to 30 mg. Do we have to start at a lower dose or should we give her the normal 30 MG dose in the mornings? My daughters father abuses adderall. He has a stedy supplier and takes 3-4 adderall the first day maybe 2 or more depending what he has left over and crashes the third day. I begun to recognize a pattern of agression the second day off lasting to the fourth day off. Ive known him eight years and I believe hes been taking it off and on the entire time. He left the home six months ago,although he was never really home. It was a relief becase he is verbally abusive to me. Very loud, easily agrivated etc. He visits his daughter when he feels like it and for the past two weeks his verbal agression towards me is out of control. He looses himself and cant stop talking or yelling. Usually with my daughter in the room. I have also been recieving horrific texts. Cursing me out calling me names. My question is Can adderal abuse make someone loose their inhibitions and act violently. Am I in danger. Will this only get worse. Is this the beginning of something that is going to escalate? My friend brought a lot of adderal to school and gave me a couple and told me to snort them. I think they’re 30 mg and I snorted like 4. I haven’t been able to sleep but I feel great and honestly want more. It’s Wednesday now and I took them on Monday. I haven’t slept. I think I have a really bad problem. Not as bad as other people but still a problem. I have atrial fib.! Adderall does trigger the event sometimes, but I’m on a bloodthimnes. safe, right? Hi Verna. I don’t know how many pills would 750 milligrams be because Addreall is available in different strengths: 5mg, 7.5mg, 10mg, 12.5mg, 15mg, 20mg, and 30 mg. I am the mother of a teen boy with ADHD. His pediatrician recently put him on 10mg a day of adderall. There are over 50 side effects with this drug, why is it still on the market? My son is currently sleeping in the middle of the day since the drug makes him unable to sleep at night. He has been completely loopy and looking zoned out for a week now, paranoid, complaining about a sore throat, running a fever, and about 10 other major side effects. Most of all, far less focused. I am a very over-protective parent, but many parents are not. Many of these ADHD adderall children will be neglected when it comes to these excessive side effects. I have heard an adderall mother say, “Oh she’s fine, just on adderall.” Fine? The kid is sobbing for no reason under the table in a restaurant!! How can doctors justify subjecting children under 18 to this major drug with major physical and mind altering side effects for the sake of focusing? What happened to behavior modification and teaching a child, parents, teachers, the tools to best deal with a child’s special needs? I think the over prescribed adderall addiction today (including adults who use it as a diet pill) is a sad reflection of our society. The quick fix is not fixing anything when it comes with a side of over 50 side effects. What is the probability your child will get at least one of those side effects? Will you know? Will he tell you that he has a side effect of abnormal (wont go down for hours) penile erections? Probably not. I’ll be taking my son off this mess. He has more problems on adderall than off! It should be deemed an illegal drug in my book. Adderall at 90-120 mg just makes me quiet and lazy. I have no heart issues and I can sleep just fine. I keep myself healthy and my blood pressures goes down on the med because it makes me tired and calm vs. loud and reckless and rude to people. I take it to avoid the drama of everyone else complaining about how rude, loud, high strung, impatient and impulsive I am. I am on 90-120 mg and I don’t notice any difference but I am more mature, appropriate, conscious of things when planning and making decisions. I am a tad humorless and take things a bit serious on the full 30 mg doses (3-4 doses a day) but I go off of them a lot just because it reminds me of being a kid and cheeking them at the nurses office and it feels like I was released from slavery. Hi James. Do you have anyone who could drive you to the ER? You are severely dehydrated by now and exhausted from the insomnia. Please don’t wait any longer, you need IV and medical assistance. Hi, John. I’d suggest you take your son to the doctor’s. Is the adderall prescribed to him? If it is, you can talk to the doc about the side effects and changes you’ve noticed in your son. I believe the doctor will take him off the medication. My son takes Zubsolv and Adderall. Will Zubsolv offset Adderall and prevent the high? He does not need Adderall for ADHD or ADD. He takes it because he thinks he needs it to focus. However, when taking Adderall he gets very argumentative, and physical. Hello John. Some people have displayed aggresive behavior while on Adderall. But, to what extent will a person react is majorly an issue of character. Can adderall make you physically aggressive, make one combative, make one quick to argumentative, and quick to strike out and punch and/or push someone? Hello Makell. It’s possible that after daily use you’ve developed a tolerance to amphetamines. Stimulants can affect your heart, breathing, and sleep cycles (as I’m sure you’ve noticed). While we don’t suggest you continue to abuse Adderall for non-therapeutic reasons, it might help to lower the dose in order to lessen risk of side effects. I’d suggest a slow taper or period of abstinence as a measure for harm reduction. alright, i am 16 years old, and had never done pills until this year. the first pill i tried was adderall, and i ended up taking 215mg by the end of the day and stayed up for 3 days i personally thought it was the greatest high ever. all this was only about 3-4 weeks ago. i havent been taking them everyday but when i do i take alot, and well today i had 100 10mg adderalls. right now im on 415mg and i barely got high all day. i dont believe im addicted but how bad is taking that many on my body?! Hello Liza. I am sorry to hear that circumstances have come to this for you, your family and your brother. Have you talked with his prescribing doctor about his frequency of use? A few months ago i had started snorting adderall because everyone told me it gives you tons of energy, which it definately does… i dont know that i was addicted as i only took it on the weekends because i didnt want to show up at work acting like a lunatic… anyway the come down was what made me decide to quit, i would snort some on friday and not be able to sleep until sunday, I would get very irritated when i would come down from it, i hated the way it made me feel after that. The taste wasnt the best either. I’m glad i made the decision to stop. Hi Stormy. Thanks for your question. I’m sorry to hear that you are experiencing unwanted side effects from Adderall, even though it seems to be helping you treat the symptoms narcolepsy and ADHD. To answer your question…NO. Not everyone reacts to medications in the same way. Check out the link on this page to the FDA drug label for Adderall (under Reference Sources) to read more about side effects that people have. The side effects that you describe occur, but not everyone will experience them. You need to also talk to your doctor about the effectiveness of Adderall in the long term. Adderall has not been clinically studied for long term use, and you’ll need to be periodically evaluated to measure the cost vs. benefit of continuing to take the medication. We hope that this helps. Please let us know if you need more information. So Im 16 and Im 112 pounds on a good day Ive been taking adderall for the past 3 year to treat my Narcolepse and ADHD. Im doing better at school then I ever was and Id never dream about abusing adderall because it does give me the privledge to do so much more then I thought I was capable of doing. But I hate the side effects I get from it like all the weight loss, pukeing, my skin becoming paler and not being able to relax. So my question is does everyone get those side effects aswell? Or is it just me? Hi Tammy. It sounds like you are aware that taking Adderall is harming your body. And that you are abusing it. You really need to see a doctor or pharmacist to report the symptoms that you are describing. Perhaps they are related to dose, method of administration, chronic use, etc. But these physical symptoms are indicators that your body is out of balance. It’s telling you to get help. If you are ready to address the psychological and emotional reasons that compel you to continue taking Adderall, a doctor can help recommend you to local addiction treatment services. Are you ready to quit altogether? I am 18 years old, five foot two, 98 lbs, and I abuse up to 350-400mg of adderall daily. Although there are days when I will take about 250-300mg only, but if I dont take the pill at all I get withdrawals. When the adderall first kicks in I get severe heart pains and back pains, I become dizzy, pale and I feel like im gonna pass out and throw up. What’s happening to me? Is it normal to feel jittery when first beginning Adderall for ADD? Does it go away with increase of mg? Hi Susan. Your grandson should take Adderall exactly as prescribed. Check the label or call his doctor for confirmation on dosing. However, Adderall and Adderall XR (extended release) are usually taken daily. You can Google the term, “FDA medication guide Adderall” to learn more. But make sure he is swallowing the pill or capsule and not chewing it to ensure that he is taking it properly. My 8 yr old grandson is on Adderall for ADHD, should he take this medication all 7 days or just on school days? Adderall is SO addictive. I was totally abusing it, my mind was always racing on adderall…withdrawal was horrible. There are tons of stories of heavy adderall abuse online.